For caregivers and their aging family members, the amount of time dedicated to personal care can become physically and emotionally taxing. The elderly are often embarrassed or upset that they have to begin to rely on others to carry out basic personal hygiene tasks, and as a result often do not request the help they need in order to stay completely sanitary. Below are some tips on how to keep your elderly loved ones on track when it comes to personal hygiene. Settle on a bathing schedule. Coming up with a bathing schedule together allows you to ensure that an elderly family member is maintaining proper standards of hygiene, while allowing them a degree of autonomy in the formation of that schedule. This will mean that you are not at odds when it comes to when and how your elderly family member is going to take a bath, shower, sponge bath, etc. Create a peaceful environment. The best way to ensure that your elderly family members do not feel uncomfortable with and/or resentful of their need to be assisted when bathing is to create an environment that is peaceful. Music and soft lighting might help to not only lighten the mood, but soften the blow to their ego. Allow them to maintain as much as their self care as possible. It might end up taking an elderly family member a bit longer to accomplish, but if they are physically and mentally capable of taking care of some of their own hygiene needs, you should leave them to their own devices. Avoid shaming. Elderly family members can become extra sensitive to the perceived shame that comes along with smelling or looking unclean. Accusations will only cause them to retreat or even hide the fact that they have been unable to accomplish a basic personal hygiene task, which will only make matters worse. Don’t overlook dental care. Elderly family members may need some reminding, but dental care is generally one area where seniors are able to maintain a high degree of autonomy when it comes to setting their own schedule and fulfilling their own needs. They may, however, require reminders when it comes to daily brushing or denture care. The ability to take care of our bodies and personal hygiene needs is something that most people who are not elderly take for granted. With age, however, come lapses in memory, as well as physical and mental ability. 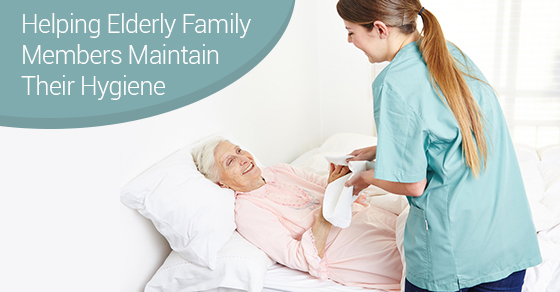 Making sure that elderly family members are happy and healthy means ensuring that their hygiene needs are looked after and attended to by more capable family members, whenever necessary. Follow the above advice and make sure your elderly family members keep on track with regular hygiene routines.